How has your week been so far? Good I hope. The usual working and visiting my Grandad in north east Yorkshire. It's about 4 hours away from where we live in north wales luckily my daughter has always been good on long journeys. Always nice to get away for a few days. 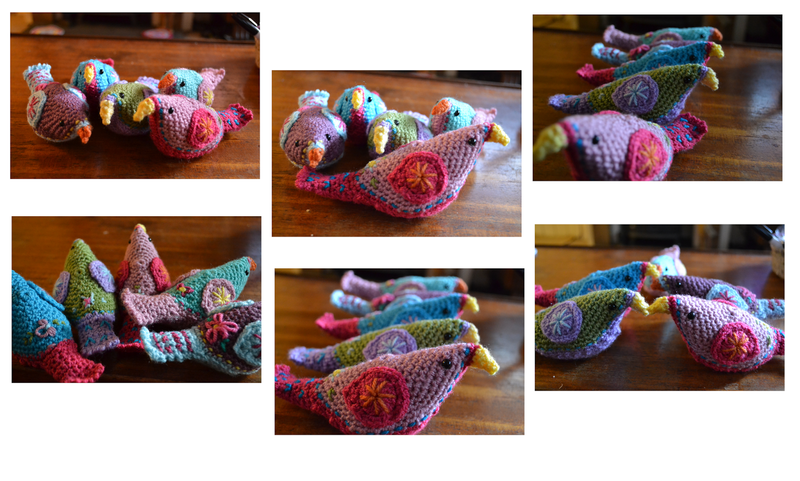 This week crochet wise I have jumped on the Attic 24 band wagon and hooked up five bower birds. They hook up a treat with clear and well written instructions. I really enjoyed the stitching parts where I could personalise each birdie and give it, it's own character. I wanted to show you my mantel piece because its made me smile this week having not one but two vases of flowers and my new dolls. 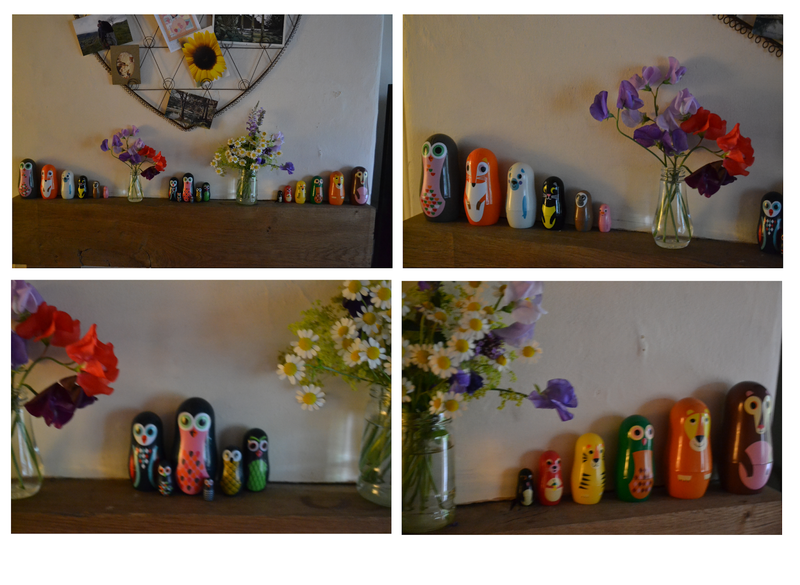 The nesting dolls were a bit of an extravagance for me, especially when I'm supposed to be paying for a wedding. So you may have just seen that I mentioned the wedding eek its getting close now! So if I do go quiet you will know what I'm doing. I'm hoping to keep up with things. I will leave you with these chirpers! Glad you got away and had a nice visit. Your birds are wonderful. Good luck with the big day coming. Your birds are adorable! Love the pretty colors as well :) Hugs to you! Lovely to hear you've been to see your Grandad again FB and I trust he is well. Your little birds are a delight, doesn't hurt to have a treat now and again. Good luck with the wedding, hope all goes well. Oh your little birds are just darling! You have such a lovely was of creating! Fun to visit you again. Not long to go now! How exciting. Those wee bower birds are just gorgeous, bright and cheery and guaranteed to make you smile. Love your pretty little bower birds, you have made quite a flock! Such lovely colours too :) Good luck getting ready for your wedding...such an exciting time! Yours are the first bower birds I've seen that actually make me want to have a go at making some of my own. They look great altogether. All the best for your Big Day! Hope all goes to plan and you have a great time. Hi! 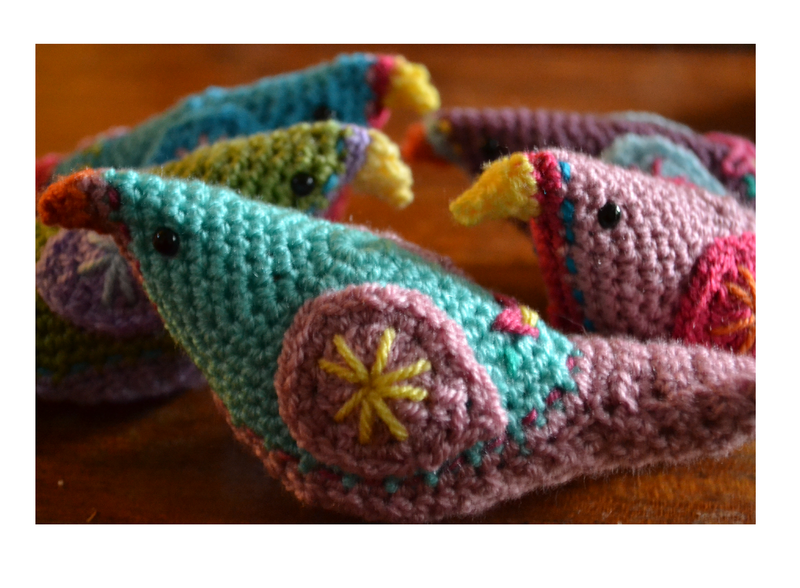 These little birds are so pretty, well done for making a whole flock in one go! Just wanted to wish you all the best for the upcoming wedding, hope all the preparations go smoothly!